Spirals & Spatulas: J's Next Job - Hotel Blocks! At some point it dawned on me that I would need to do that whole room-reservations-at-hotels thing. I wanted to get it done before the Save the Dates went out so our wedding website could be all updated before anyone looked at it. I mentioned to J that I didn't really feel like I knew what I was doing on the hotel thing, and he was all like "oh well you just do this and then this and they'll do this and blah blah blah." So I'm like "J...how do you know all this stuff?" and he's like "Oh, I had to do hotel blocks when I planned that fraternity convention in college." Umm hello? Why the heck was I stressing over hotels when J has done it before, and could do it for me? So, I took the hotels thing off of my to-do list, and placed it on J's. He researched the hotels in the surrounding area and picked 3, and then he called them and got it all worked out. And all I had to do was put the information on the wedding website. Love him. 3. 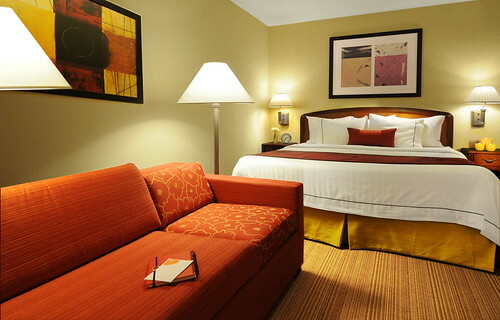 Courtyard by Marriot - discounted rooms, super-close to the church! DON'T agree to anything that could possibly force you to pay for unused rooms. You shouldn't have to. DON'T pick hotels that are not within convenient distances of your wedding. They may be cool hotels, but people won't want to stay in them. DO check online ratings for your hotels. You don't want to send you guests to anywhere yucky! DO pick a variety of hotels in a variety of price ranges. We picked one that was suite-style for the families that are coming, one that has a free shuttle so guests can use it to get to/from the wedding, one with free breakfast, one near a shopping mall, etc. DO ask the hotels to set up an online reservations link for you. It's much easier than making your guests enter a "Group code" into a textbox that can be hard to find on the reservations page. DO let your groom be all proud of himself when a hotel's event manager tells him she "never gets phone calls from grooms, only brides!!" So, which one would you want to stay at?